Cliff enjoys travel, dance, martial arts, writing, music, and being a dad. He’s happily married and lives in California. Favorite Colors: Black and Purple. Favorite Cuisines: Indian, Chinese, Ethiopian, and Brunchy-Type Foods. Favorite Artists: Claude Monet, Vincent van Gogh, Michael Whelan, Brom, and H. R. Giger. Favorite Architects: Antonio Gaudi and Frank Lloyd Wright. Favorite Class in Kingdom Animalia: Cephalopoda. 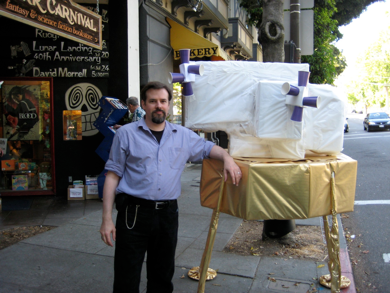 Nifty lunar lander model designed and built by Jack Rems of Dark Carnival bookstore.